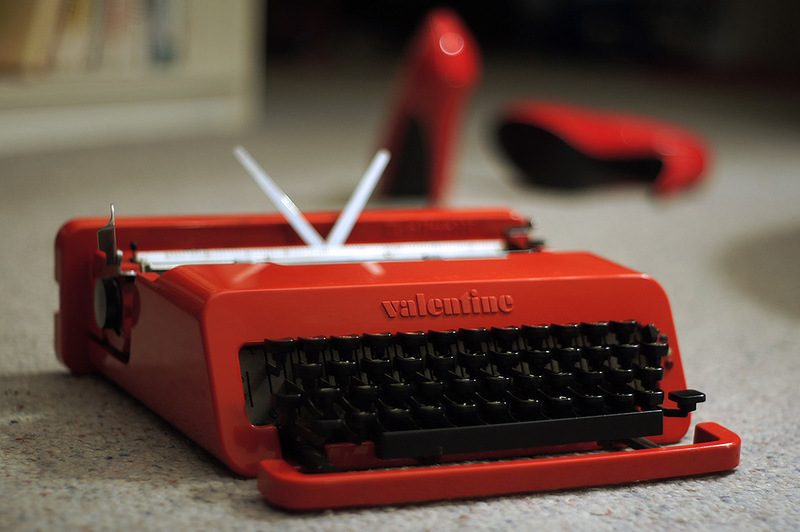 It may seem twee to be writing about my Valentine typewriter on Valentine’s day, but then again my disdain for my Valentine has been rather well documented. So it may surprise a few people that I revisited the Valentine, which hiding at the back of my collection, and found myself being both frustrated, and then seduced by this machine. It all started late last year on Facebook. Or more accurately, with a friend from my past. This friend had been seeking me out on Facebook, but I wanted to have absolutely nothing to do with them. With a click of the block button they were gone – out of my life, and I expected them to be out of my mind forever. But they weren’t out of my mind. The situation bugged me for days, and after a little while I decided that it was time to write to them, and express my frustrations and hurt and ask them not try to contact me again. So, I rolled out my Valentine. I had mixed feelings of anger and sadness, and the Valentine seemed to be the right keyboard to take it out on. Before long I had paper loaded into the machine, and I was bashing out a note to my now rather ex friend. The Valentine however, didn’t survive the length of the letter. Its scratchy carriage continued to grind and moan at every press of the key, and the escapement occasionally jammed and condensed letters together to form a blob of words. By the second page, the machine gave up the ghost. One of the bearings that I had painfully re-inserted 6 months ago shot out of the carriage unexpectedly mid travel. But I continued to type on the machine with the carriage wobbling around in a rickety motion until the letter was done. I finished the letter and pushed it into an envelope. The next day I grabbed all of my outgoing mail, and headed to my nearest Australia Post mailbox. 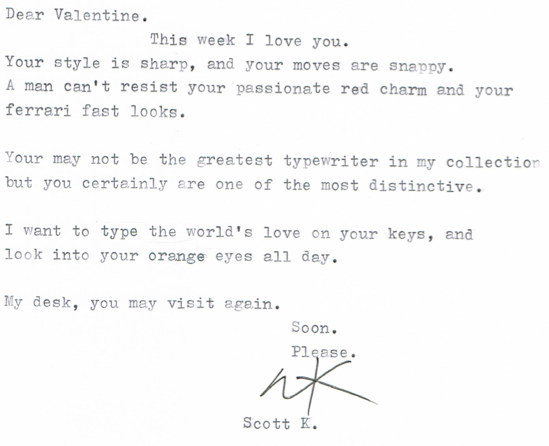 But before I did, I left the letter typed on the Valentine behind on my desk. I was now left with a wounded Valentine. After I’d previously re-assembled the carriage I had never been happy with the action of the machine, and I just had a feeling that it wasn’t trustworthy and that feeling proved to be right. I mulled over the mechanism and I couldn’t quite figure out what had happened. It seemed physically impossible for the machine to dump a bearing mid movement, and I couldn’t see any signs to tell me what had actually happened. 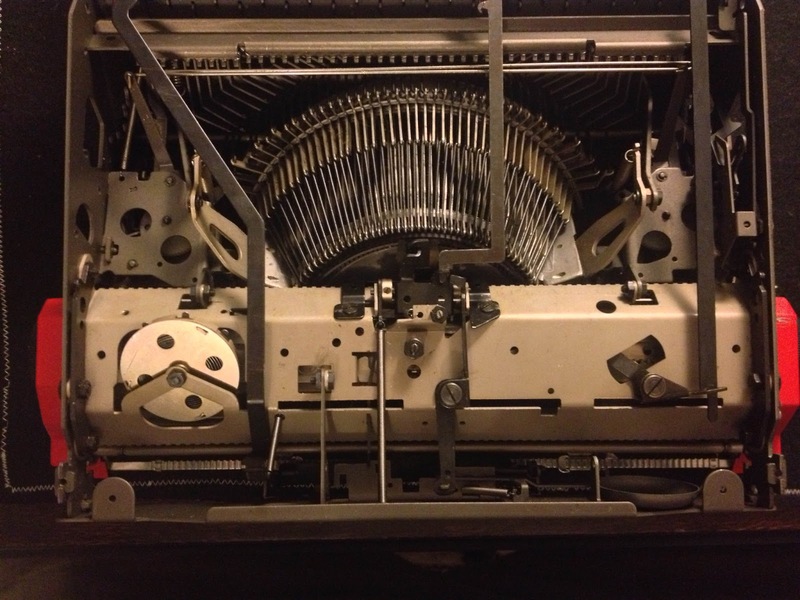 The best I could figure out was that bearings may have been worn down, or that the retainer had jammed in the middle of the movement – forcing the bearings to jam and push out the side of the retainer and shoot out of the typewriter. Obviously this was going to need the bearings to be once again re-inserted. But I just didn’t have the heart to do it again, so I tucked the Valentine back into my cupboard until I had the patience and the mindset to do so. A somewhat casual auction. Much more relaxed than ebay. In January I flicked through a catalog for an antiques auction over in Woolloongabba and spotted an interesting Art Deco table that had been poorly photographed, but showed some real potential. I popped down on the day of the auction, and discovered quite a beautiful table. While the auction progressed I picked through the bits in the store-room for a couple of hours until the table come up for auction. I bid – and won – a stunning 1930’s dining table for a whopping $30. It would have been $20, but a dealer put in a half-arsed $5 bid against my first bid, just to see if he could score it cheap. I’d budgeted for significantly more than $30 for this table, which was pretty obvious to the dealer after I countered his bid within seconds, and he dropped out out of the running as he wasn’t really interested. Furniture wasn’t really selling that day, and most of the dealers that were there were looking for little things that could be sold at markets or along with other items in their stock. Oddly several sets of antique bottle openers sold for more than the table did. Jewelery seemed to be the hot item, while my table was the only table to sell for the day. While I was digging around the storage room, I discovered an Olivetti Dora buried in a job lot. The machine worked brilliantly, but was in a horrible state. The case was water-damaged, and some of the plastic had fused to the plastic of the Dora’s Shell – staining it yellow and making it appear as though it had been burned. Also along with the typewriter in the job-lot was a marvelous label maker. I bid, and before long I was the excited owner of a Dora and a label maker with about 20 fresh rolls of tape for a bank-breaking $10. I grabbed that, and a few other trinkets that I’d bought, loaded up Ruby the Exxy and headed for home. When I bought the Dora, I have other ideas than adding it to my collection. I could have spent hours fruitlessly trying to do something to the shell of the Dora to make it look nice again, or…. I could just use it as a parts machine. When I got it home and typed on it a little I was surprised by how well it worked. It was actually quite a nice typewriter. So I reconsidered my course of action for a moment, but then just through to myself – ‘the world isn’t going to miss one ugly Dora’, and I promptly started to deconstruct the machine’s shell. From a mechanical point of view, this Dora was pretty good. However, it had been filled with silt and muck – most likely from being stored in someone’s leaky shed, and was most going to need a lot of cleaning. Frankly, I couldn’t be bothered scrubbing the whole thing out. I flipped the machine over, and after dropping out no more than 8 bolts and two springs, I pushed some levers aside and I had the part I needed. There can be only one! (swings sword). I speak of course, of the entire carriage. Not just the rails, not just the platen, not just the paper table etc. But the entire array. I spoke to John on the phone about what I was doing. Speaking from his experienced Olivetti typewriter mechanic point of view, his comment was blunt: “Fools rush in, where angels fear to tread”. John was right, of course. I had no idea of the complexities involved with relocating an entire carriage into a new machine. But I sure didn’t have any intention of putting myself through the grief of relocating the bearings again – particularly as there was clearly something very wrong with them. But the job turned out to be quite simple. I ripped the Valentine’s carriage out, and plonked the Dora’s back into place quite quickly. I even gave everything a scrub along with a grease and oil change while I was at it, so all the important bits were well looked after and running very smoothly. it all seemed to be such a simple repair. I flipped it over, and before shoving the shell back on, I gave it a test run. Okay… so… where do I start fixing this. So, I flipped the machine over gain and loosened the bolts, screws and bits and pieces. Progressively things sort of worked as I fiddled with them, but adjusting things in one direction seemed to put something else out. So soon it got to the point where it occurred to me that the entire carriage array must need some kind complicated adjustment procedure performed to ensure that everything lined up correctly. After a little bit of thinking, I thought I had come up with an idea on how to do this complicated adjustment procedure. 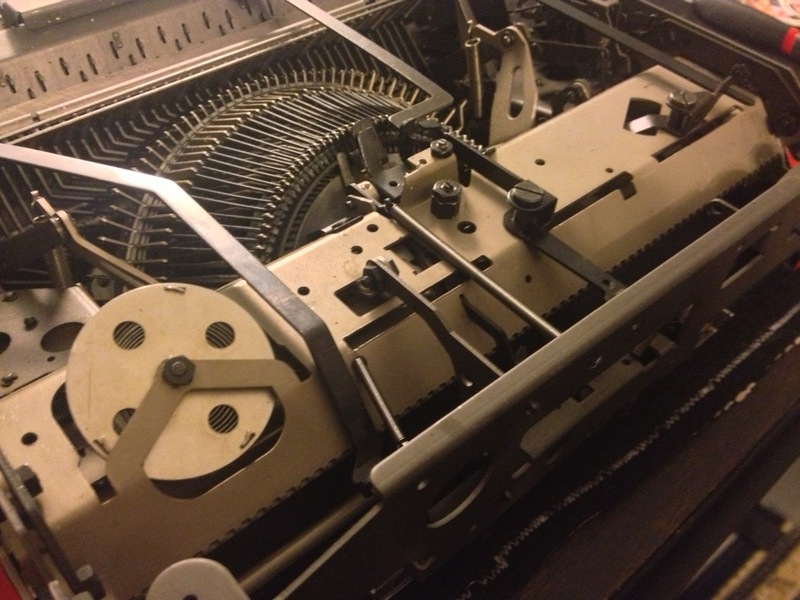 I flipped over the machine and loosened off the 6 bolts retaining the carriage array to the side, then pressed down hard on the carriage while re-tightening the bolts with retaining this compressed state. Well, except for a couple of things that I had ‘adjusted’ earlier, which I had to screw back to where they originally had been. I quickly bolted everything back together, chucked in the new ribbon that I had been using previously in the machine (I use a mostly dry ribbon while testing repairs) and give it a bit of a burl. And you know what? After being serviced, cleaned and adjusted to death, this carriage would have to be the smoothest moving carriage I have ever found on an Olivetti. And I mean… this was SMOOTH. The plastic shell of the case which reverberated bumps and grinds previously, was now astonishingly quiet. Only my Hermes 3000 machines are smoother and quieter. This was an outcome that was completely unexpected. So I quickly pushed in a few fresh pages of letterhead paper, and turned out a couple of long overdue letters to a couple of members of the typosphere. And you know what? I actually quite enjoyed my time with my Valentine. There’s some aspects to this machine that are a bit unrefined, but largely I found this typewriter to be a very competent typewriter. It isn’t the pinnacle of typewriter engineering, but it was a surprisingly comfortable, quiet and stylish machine to use. I’m not in love. Oh no. But this is one Valentine that I’d be happy to go a round with twice a day, and three times on Sunday. (my overseas readers may not quite catch onto what I’m saying there). The letter that I typed before I repaired the machine still hasn’t been posted. It sits in a box – maybe for life. I may find a moment to burn it and let go of the memories of a long passed toxic friendship. In the meantime, I’ve gained an appreciation for a beautiful Valentine. P.S. I used the shift keys from the Dora – which were the more modern Lettera 32 square style, to replace the missing shift key. I also replaced the non missing shift key as well, so everything matched up. ← Just appreciating my typewriter a little. Ironically, it is one Olivetti that has eluded me (never mind the Dora, whose design is actually no-design). I almost snagged one last Sunday but backed out of the $275 price tag on ebay Buy it Now. I know that price might be considered relatively low since the going rate is $300-$400. But I stepped on the brakes and decided to wait for my right Valentine. Great work on the Valentine. I have always wanted one of these, but for the prices in the States, I may never get one. Similarly, many typosphereians comment on Adler J4 and J5 models as being not very good typers. Well, I can attest to them being very good, and the carriages are very very smooth, after a good cleaning (and maybe a few tweaks). 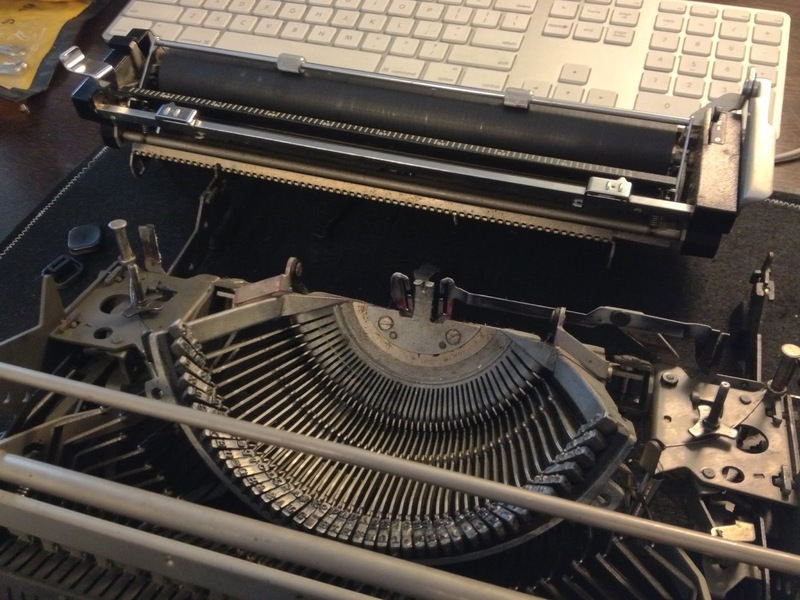 My Adlers are much smoother than my other typewriters. I know how you feel. They seem to consistently hit about the $250 mark here. However, of late I've noticed that they have been more around the $150 mark. I think interest may have been dropping in these. Well… not how can I not love one of my machines! it is interesting that you say that Bill, as I my Gabby 25 has responded surprisingly well to the Teflon Lubricant that I put on it. But more on that soon…. And yes, the prices have become – absurd! I don't know why they have been so desirable. Then again, I see 10 lettera 32s listed a week, and yet some of them seem to get quite a high price. Odd. 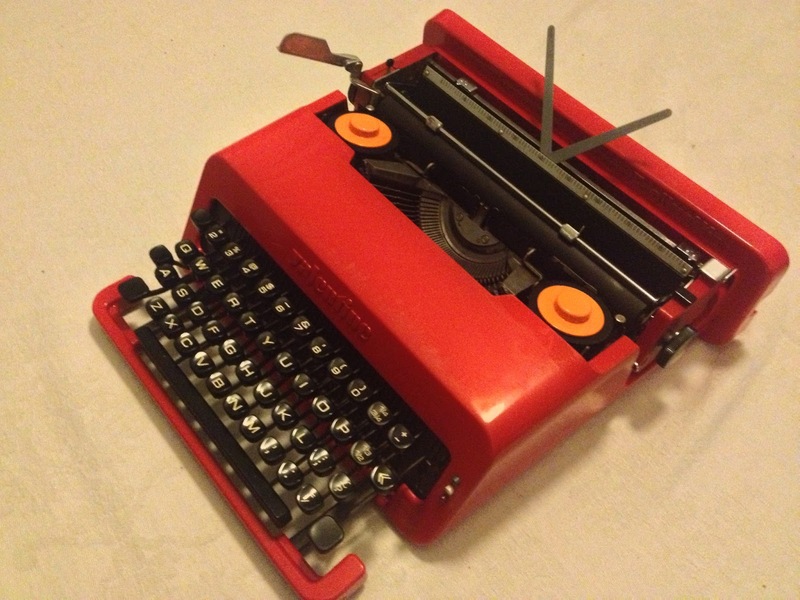 Valentines are basically the only expensive typewriters in Switzerland – and after using Adwoa's last year, I decided that it “felt like a bucket” and that I didn't like the feel. The design, however, is still unique. I love the photo with the high-heeled red shoes in the background. Ah yes! Minolta F1.7… with very minimal lighting. You spotted it! And thank you. It does seem so odd that these machines hold such a high value. All in all, this machine cost me about $80 all up – including the parts machine. Well, I tried to catch that sort of… 'trail of clothes' feel. I was largely happy with the photo though. I'm glad this lovely machine is no longer a disappointment. The next time I am cursing over a typewriter malfunction, I'll remind myself that it is as old as I am. I've seen a few late Olivettis sell new in box recently on ebay and wondered what a new machine would feel like. I think I saw those Olivettis actually. I was quite curious as well. Thanks John! I do have a little issue with the margins still, but it will have to wait till I have the motivation to rip the case off again. I think it should be easy to resolve.